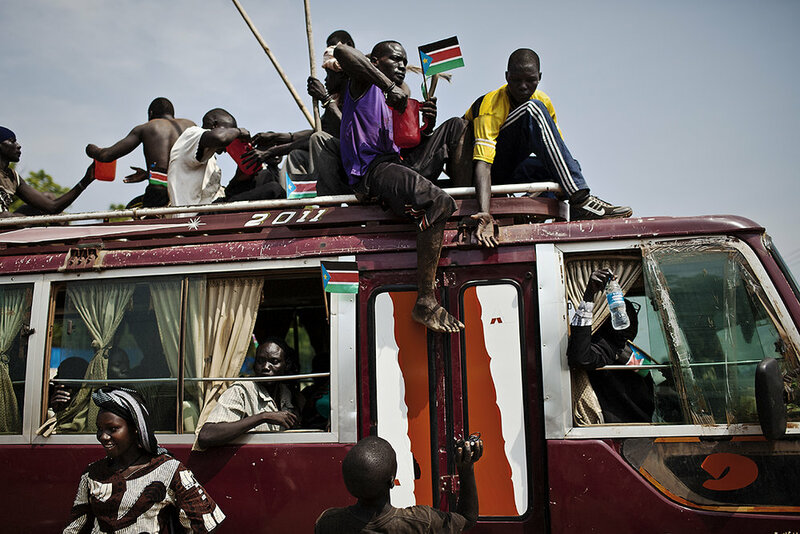 On July 9th 2011, South Sudan celebrated its independence as the world’s newest nation. The civil war in Sudan came at a terrible cost for the Southern, predominantly Christian Sudanese who fought Bashir’s forces for more than two decades. 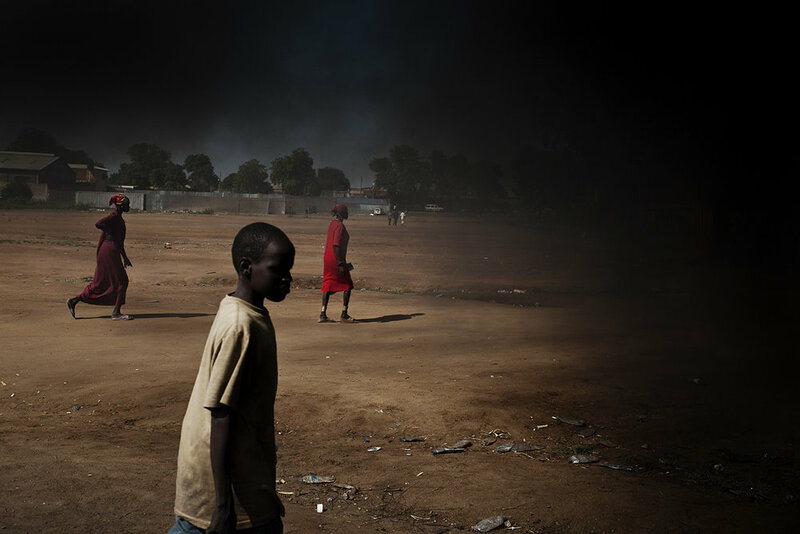 The years of fighting resulted in two million South Sudanese deaths and the displacement of nearly four million people. Sadly independence did not bring conflict in South Sudan to an end. 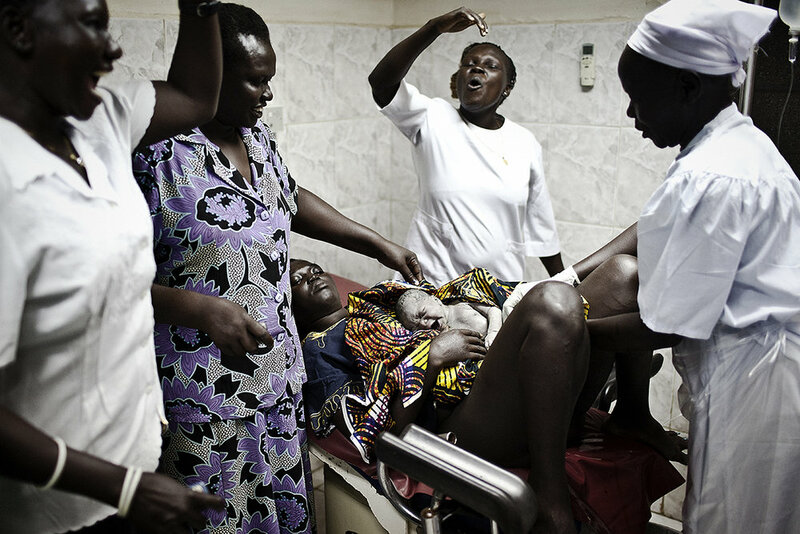 Civil war broke out in 2013 when the president fell out with his then vice president, leading to a conflict that has displaced some 4 million people. Most coverage of Kiribati evokes a sense of the acute vulnerability of the nation: coconut palms with exposed roots, clinging to eroded coastlines; angry waves crashing against sandbag seawalls; the ocean seeping into people’s homes. Kiribati has become an international icon of vulnerability, and is portrayed as a country at the edge of the world in terms of remoteness, and at the end of the line in terms of prospects: a nation doomed in the face of climate change. However, portraits of the daily livelihood practices of I-Kiribati reveal a story less told: one of strength and resilience. Although globalisation and development processes are driving social change and generating a wealth of challenges, I-Kiribati view the deep connection to their country and culture as a source of strength, which is helping people to deal with both the present development challenges, and the future climate threats. The ocean, viewed as a source of sustenance and connection, has shaped I-Kiribati culture and traditional knowledge, and is intimately connected to people’s daily survival. The wealth of tuna fisheries in Kiribati’s Exclusive Economic Zone (EEZ) is also a significant strength and opportunity, and holds the key to Kiribati’s economic future. 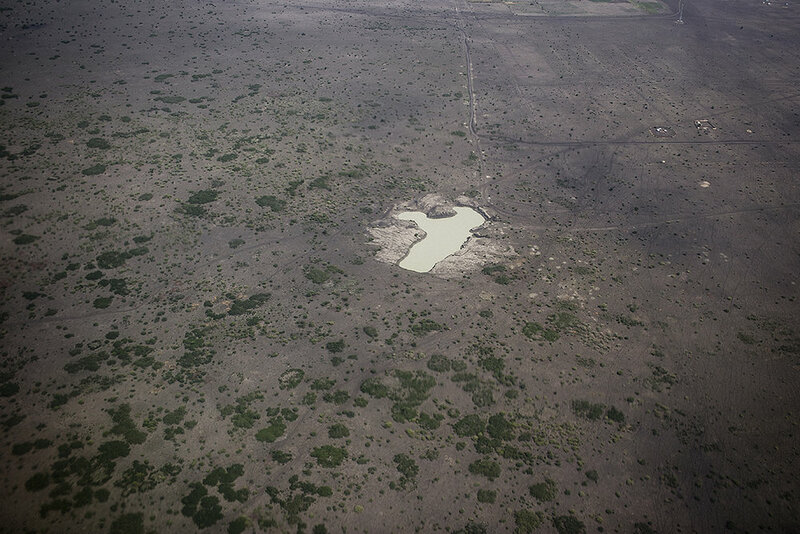 When flying into the capital island, South Tarawa, the fragility of the nation is apparent: a sliver of land, arching across a lapis lazuli ocean, around a turquoise lagoon. Kiribati is, by all accounts, vulnerable to climate change; however, on arrival you realise that current development issues constitute the most pressing challenges that I-Kiribati face. The one sealed road that runs down South Tarawa is illustrative of the rapidly growing population: youth in brightly coloured school uniforms parade along the roadside, avoiding the puddles on their way to school. Half of South Tarawa is under the age of 18 and the rapidly growing population is placing unprecedented pressure on social services and infrastructure, including provision of freshwater, and sanitation and waste management systems. The consequences of these development challenges are felt at the household level, and people struggle daily to find enough food, freshwater and income to meet the needs of their extended families. Although taste preferences are changing towards imported foods, fish and marine resources have remained a mainstay of the diet. Fish constitutes the primary source of protein. Traditional fishing and navigation skills therefore continue to be practiced and passed on, as they remain relevant to people’s daily lives. However, past overfishing and illegal fishing by distant water fishing fleets is threatening the food security of families, and the livelihoods of subsistence fishermen. On the global scale, dwindling stocks of tuna in the eastern Pacific have increased demand and invariably price for tuna in the central and western Pacific, where the last great shoals of tuna can be found. The Government of Kiribati is beginning to realise this economic opportunity, and also the great challenge of managing this resource sustainably. The closure of the Phoenix Islands Protected Area (PIPA) – the largest marine park in the world - to commercial fishing earlier this year signals a serious commitment by the Government of Kiribati to the sustainability of this resource, which is the economic bloodline of the nation. 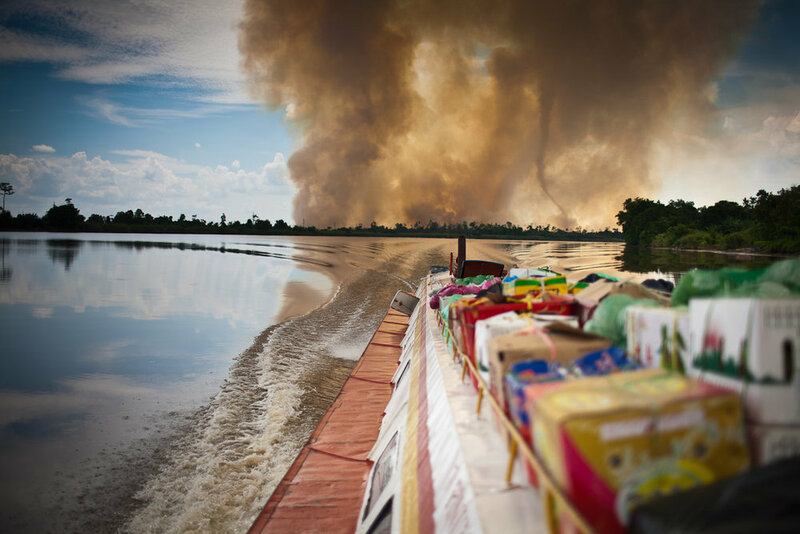 “We can not live without the forest” Bapa Sagung Raja tells me as we cruise up the Baram River closing in on Long Lama the last town before our half day drive into the jungle. Bapa Sagung is the head man of what is believed to be one of only seven nomadic Penan communities still living in the Sarawak jungle. The Penan people are one of the few remaining Indigenous tribes in Sarawak also commonly referred to as Malaysian Borneo. Sahabat Alam Malaysia is one of the main NGO’s working directly with Indigenous communities in Sarawak in an attempt to support them in their struggle against the Government supported logging industry. The future for the few remaining nomadic Penan communities is bleak and the State Land Development Minister Dr James Masing who told the media that in 2010 alone, the opening up of land reached its highest rate on record in Sarawak further reinforced this point. The governments plan to create the largest palm oil producing state in Sarawak before 2020 leaves very little hope for the Penan communities, in fact their small tracts of untouched land could very well be in the aims of the logging companies. Bapa Sagung isn’t entirely sure of his age but thinks its close to 30, his community is made up of his direct family that includes his wife, four daughters one of whom is married with a young son of her own in addition to his wives family. The food consumed by the two families comes directly from the forest, the two most common sources include sago which is made from the flesh of a particular palm tree and the other main food is meat. The meat eaten by the community is as diverse as the animals that make up the jungle, these include pig, deer, lizard, monkey, fish and clams, most of these animals are caught with the poison blow darts referred to in Penan as ‘kelleh poot’ They are known for Molong which means to not take more than is necessary. The Republic of Uzbekistan is a country that over its history has been ruled by Iranians, Muslim Arabs, Turks, Mongols, Timurids, Uzbeks and most recently Russians. These rulers live on through the diverse faces that make up the 31 million citizens of modern Uzbekistan. In Uzbekistan there are countless moments of generosity, warmth and mouthfuls of gold teeth. Disembarking from a Soviet era train we arrived in Bukhara, an old city that truly felt ancient. In fact Bukhara is more than 2000 years old and is the most complete example of a medieval city in Central Asia. Wandering the eerily quiet streets of the old city, we passed the impressive Jewish cemetery, where many of the city’s Jewish community have been laid to rest dating back to the 16th century. As evening came we relied on street lamps and living room lights to guide us out of the back streets. Eventually we found our way to a main thoroughfare and the Lyabi-Hauz Park. Lyabi-Hauz was a hub of activity in the evening, along the edge of a pond Uzbek families and groups of Russian tourists ate at an outside restaurant. The three of us were enjoying some people watching from a good vantage point when the restaurant’s DJ started to blast music from a set of antiquated speakers. The song was like an invisible cue and within moments tables were deserted and the pavement between them became a dance floor. Uzbek couples, groups of friends and the occasional kid danced away as if no one was watching. However the crowd watching on was growing steadily and soon enough the audience of bemused Uzbeks included a few police officers. The officers didn’t make a scene but from my perspective they could clearly be seen. Soon enough after a few songs the music ended and the dancers took their seats and returned to their meals. In the 14th century Samarkand was the capital of the empire of Timur. Timur, known historically as Tamerlane, conquered much of modern Uzbekistan and founded the Timurid Empire which lasted for a century until 1467. 548 years later in modern Uzbekistan statues of Timur riding a horse and wielding a sword were found adorning the centre of countless roundabouts and junctions. Located in the Zerafshan River valley in north-eastern Uzbekistan, Samarkand has long been a central point for trade across the region. All visitors to Samarkand spend ample time visiting the Registan Square, a striking architectural homage to the Timurid Empire. The square is made up of three awe-inspiring madrassahs which begun to be constructed in the 14th century soon after Timur’s death and drew their inspiration from the Safavid monuments of Iran. After a few days admiring Registan and the lesser-known Bibi Khanum Mosque built by Timur to commemorate his wife, it was time to hit the road once again. By now were well and truly in the groove of Uzbek train travel and settled in for our overnight trip to Khiva. Famous for its long and brutal history as a slave trading post on the Silk Road, the most remote of the three Uzbek Silk Road cities didn’t disappoint. Khiva’s population of 50,000 lives between two distinctly different areas, Dichan Kala an outer town and Itchan Kala the striking old city protected by a large wall and 11 gates. Khiva’s Itchan Kala is predominantly a maze of mud brick buildings. From any point within the old city the fortress like perimeter walls can be seen. As the sun sank into the Karakum desert, the old city’s hay coloured buildings began to take on more of a golden glow. We wandered the old city under the cover of a spectacular set of stars. We eventually found ourselves sitting under the 57 metre high Islam-Khodja minaret which looked more like a cosmic satellite pointing to the universe rather than a piece of Islamic architecture. As we boarded our final train, we settled into our cabin and slid the heavy Soviet doors closed as we rattled back to Tashkent. Tashkent like many capital cities entirely lacked the charm we’d found in Bukhara, Samarkand and Khiva. However what it lacked in charm it made up in quirk. Our final day in the city’s bazaar was an enjoyable way to slowly farewell the old silk route cities. Travelling on the old Soviet trains through Uzbekistan and wandering the streets of the old Silk Road cities feels like it was just yesterday. As someone that hates feeling like a tourist, our trip to Uzbekistan was unique and left me excited just to see more of Central Asia in the future. For many outsiders Kolkata is synonymous with Mother Theresa, inescapable heat and unending poverty. On the contrary Bengali culture has a rich history which is alive and well today. One of the best examples of this is the annual Durga Puja festival believed to be the world’s largest annual outdoor art festival. The Durga Puja festival fervor is about to take hold once again in Kolkata. While it happens throughout a number of East Indian states, it is by far biggest in the state of West Bengal. The state’s capital Kolkata is where the celebrations crescendo and the five associated public holidays bring life to a stand still for the city’s 14 million inhabitants. The Hindu mythology behind the festival celebrates the victory of Goddess Durga as she triumphs over the evil buffalo demon Mahishasura. The story is the success of good over evil. The mythological story of Durga has adapted over time and still remains relevant today. Spending a Durga Puja season in Kolkata, it’s evident that while the Hindu rituals remain central to the festival, engagement with the annual event goes far beyond religion. Throughout the festivities the clay statues or idols of Durga play a crucial role. For Kolkata these idols are created in the city’s old artisan quarter Kumartuli. This densely packed area close to the banks of the Hooghly River is home to hundreds of veteran sculptors and artists. These careful teams work year round to meet the demand for many key annual Hindu festivals of which the Durga Puja is the largest. Wandering the alleys of Kumartuli day or night, cigarette smoke and Bengali chatter fills the narrow lanes between the tightly packed studios of Kumartuli where artisans are busy working away on half finished statues or adding the final touches of hair and clothing. 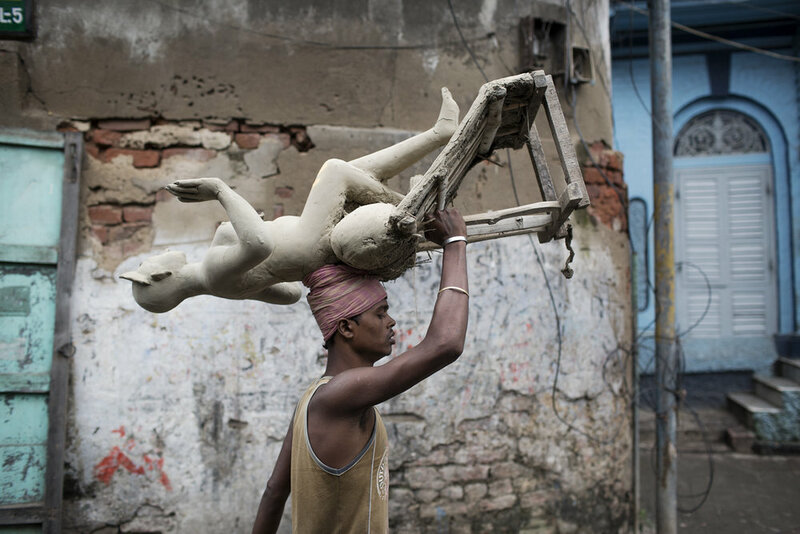 During the festival Kumartuli, is busting at the seams as teams of labourers transport the hundreds of idols to waiting trucks or boats. In some instances the teams of farmers hired for the festive season can be seen hauling the massive statues by foot all the way to their destination. While small idols may head to individual homes, most of the larger statues are destined for a community pandal. A pandal is an elaborate makeshift structure, usually in an area of free space such as a park or intersection. In Kolkata alone there are more than 2000 erected each year for the festival. Pandal hopping is a contemporary practice central to the modern festival. It refers to visiting many of the themed pandals where visitors can queue for hours for their few minutes to wander through the popular pandals which rival movie sets and theme parks. Organisers of one of 2013’s most popular pandals in the suburb of Shobhabazar estimated they had upwards of 50,000 visitors each night during the Durga Puja holidays. The Hooghly River, a subsidiary of the Ganges is central to the Durga festival. Traditionally the clay used to create the statues was taken from the riverbanks while on the final day massive festival crowds gather to watch as the idols are immersed in the river bring an end to the festival The fact that the Durga Puja festival is little known outside India highlights that perhaps India’s cultural capital Kolkata has much more to offer than previously realised. All content copyright Conor Ashleigh © 2019.